Business success is often easily measured, using simple profit and loss statements and balance sheets based on normal accounting methods. Using these simple and standard methods, a small business can easily answer whether their business is succeeding overall. If there is money left after expenses and the cash flows are exceeding those expenses, then a small business can effectively say that they are realizing a level of success. 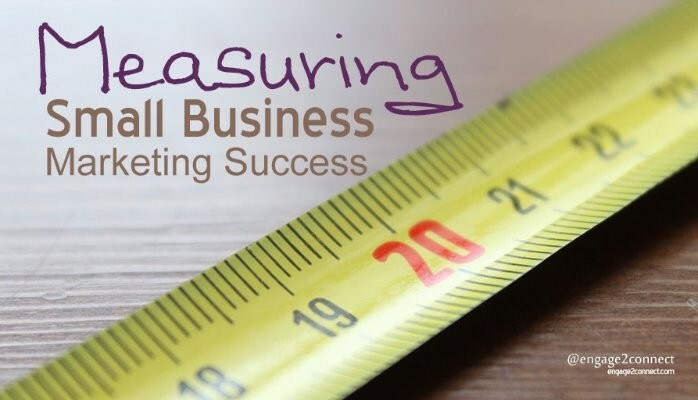 But are small businesses doing the same with their digital marketing success measurements? According to many studies, small business marketing is considerably more challenging to decipher. Yet, small businesses are facing a growing need to measure their digital marketing success, especially online. Based on a recent study by Clutch, views, posts, interactions and audience growth are the top four ways small business measure their social media marketing success. Though these metrics can be useful for determining digital strategy and target audience alignment, among other things, they are far less useful for determining social media success. In fact only 28% of small businesses are measuring the revenue generated directly from their social media efforts and only 26% measure click-throughs to their website. Probably the two most important success metrics that small businesses can measure, yet it is challenging for many to do so. What’s worse is that 13% of small businesses are measuring or uncertain if they are measuring their social media marketing success. What Is Small Business Digital Marketing Success? Similar to measuring business success, small business marketing success should have a focus on ROI. Return on investment requires that small business understand their overall marketing expenses, time and resources that go into their marketing efforts and also have the ability to track and measure the direct revenue that comes from those efforts. Looking at your local marketing efforts in this way enables you to make better decisions on where your digital marketing time and money is spent, as well as have a much higher probability of real digital marketing success. Though social media marketing is a single component of a combined strategic and integrated digital marketing program, most small businesses say it is the easiest entrance point for them. In fact, 89% of small businesses say they are using Facebook for marketing, and less than half are using Twitter. No matter which social platforms you are using to market your small local business, using the proper mix of multiple digital marketing channels and measuring the results from them is crucial for small business digital marketing success today. Further details of the study we referenced earlier shows that a huge 62% of small business marketers rank their digital marketing success efforts from very ineffective to only somewhat effective. Yet at the same time, 82% of those same small local businesses said that digital marketing is very or somewhat important to their overall business success. Do you see the massive disconnect there? The numbers become even more frightening when additional small business marketing statistics are added. The study further shows that small business commitment to digital marketing continues to be extremely low. Fewer than 50% of small businesses currently engage in integrated digital marketing activities such as search engine optimization (SEO), social media, paid digital advertising, email marketing, content marketing, and company website and mobile. In a world that is increasingly digital, these numbers show the need that small business has related to improving their digital marketing success. Though 58% of small businesses surveyed said that their digital marketing spend would remain at its current level over the next 12 months, some stated they would be increasing their marketing budget from at least 11-50% or more. This shows some local businesses are taking their perception of digital marketing importance to heart and taking the required actions to beef up their online presence, integrated marketing and mobile accessible profiles. Small local businesses need to understand that the world has changed and consumers spend their time online. Business owners need to take a look at what they are budgeting for digital marketing and put the required resources toward maximizing their online presence using multiple marketing channels that are inline with their target customers internet usage. Combining a proper digital marketing budget with the most effective multi-channel marketing approach will ensure that your small business can be found online and will dramatically increase your digital marketing success when done right. 1- Review your current marketing budget to find items such as yellow pages and direct mail expenses that you can cut or remove altogether. 2- Reallocate your marketing spend toward digital marketing components that will increase your foot and website traffic. 3- Be sure you have the expertise to implement a proper mix of digital marketing channels as well as the time and resources to make them a success. 4- Implement tools and applications that will enable you to measure the most important success elements of your digital marketing efforts, such as sales, revenue and traffic.